A slender snake, the dorsal surface is usually grey or brownish with a double row of brown or black spots. These spots sometimes appear fused giving a crossbar effect. The flanks may also have a single row of spotting. The back spots can also be joined down the back forming 2 longitudinal stripes down the body. Stripes and bars can also occur for just short parts of the markings with the double row being present as normal on other areas. Ventral surface is grey, brown, appearing uniform or mottled with white, the sides of the belly are usually whitish. The throat and forepart of the belly usually appear lighter. Length: Males reach a maximum of 60 cm, females 68 cm in the UK, though adults are smaller in Surrey. Females are slightly larger than males but have shorter tails and are usually uniform silver grey, with distinct spots. Males tend towards browns and reds, the spotting being less marked, the throat and the forepart of the belly is often orange-red. 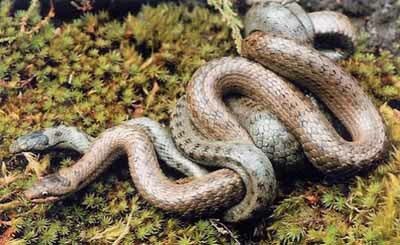 Mating occurs from mid March through to May, it is has been suggested that the smooth snake may also mate in Autumn. 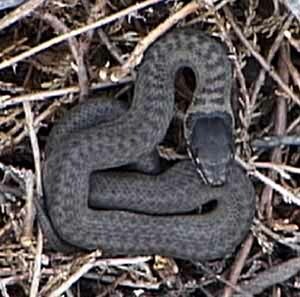 Like the Adder they may only produce young every second year when conditions are unfavourable. A maximum of 15 young are produced, born in a membrane that breaks soon after birth. Measuring from 14 to 16cm, the top of the head of juveniles is entirely black and the lateral series of spots on the body is more strongly marked. The young in the UK will only feed on other reptiles, the juveniles taking prey almost their own size. Juvenile showing completely black head marking. 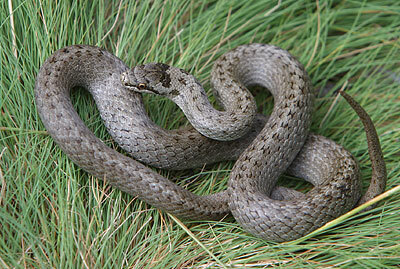 Superficially the Smooth Snake resembles the Adder (Vipera berus). However, Smooth Snakes have a smaller head and do not have the thickset body or heavy looking head scalation of a typical Viper such as the Adder. 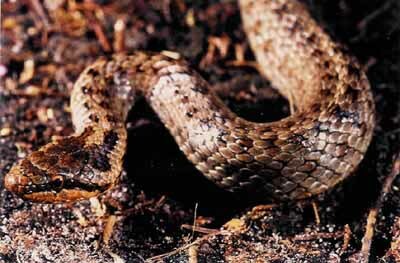 Even in cases where the dorsal spots of the Smooth Snake are fused, the markings do not resemble the zigzag line that is characteristic of Adders. The scales of the Smooth snake are not keeled (ridged along the centre of the scale) like those of Adders and Grass Snakes, this maybe used to identify a shed skin. The Smooth Snake may be confused with the Slow-worm (Anguis fragilis), which is a leg-less lizard and not a snake at all. The Slow-worm is a smaller creature (40 - 45cm) with a glassy grey/brown appearance. Slow-worms have very small scales and do not have the double row of dark spots of the Smooth Snake. 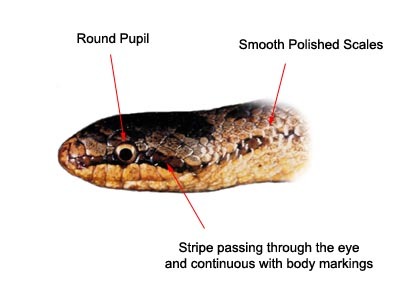 Smooth Snake showing double row of dark spots on back and continuous line from the nostril through the eye. Where will I see a Smooth Snake and is it dangerous? These snakes are extremely rare and cautious, spending much of their time under ground. They are non-venomous and totally harmless. The Smooth Snake has a restricted distribution in the UK. Now thought to be confined to the South East of Dorset, South West Hampshire and a small area of East Hampshire and West Surrey. This species is found on dry heath slopes with mature heather and Dwarf Gorse usually south facing, but some near Poole are north slopes, with damp heath at the bottom of the slope. They are also found in stands of Molinia where they live in the tussocks, especially where the Molinia is on fairly level areas with water traveling horizontally under the surface without any surface water, rather than valley bogs that are too damp in winter. Smooth Snakes are protected under the Wildlife and Countryside Act 1981.